Review: "Tempest: The Tracks We Leave" - Sea of Tranquility - The Web Destination for Progressive Music! Inspired by a Dakota Sioux proverb The Tracks We Leave, which has triple references to the environmental, spiritual and musical tracks we leave upon the world we live in is Tempest's latest album in a career which now touches the quarter century mark. Based in San Francisco, led by founding member and lead singer/electric mandolinist, Lief Sorbye they play what they describe as, "high-energy Folk Rock fusing Irish reels, Scottish ballads, Norwegian influences and other world music elements." Both "Rantin' Rovin' Robin" and "Rattlin' Roarin' Willie" are both by Robert Burns and Tempest mix newly-written tunes from the pen of Sorbye and his wife Patricia Reynolds alongside and whilst it is a point of discussion as to exactly how progressive (rather than folky) the music is it is certainly well worth a listen. Other than the somewhat stereotypically "Celtic September Jig", The Tracks We Leave is mostly life affirming and uplifting music infused with influences not just from Celtic lands but from the Middle East and is a more than worthwhile listen. 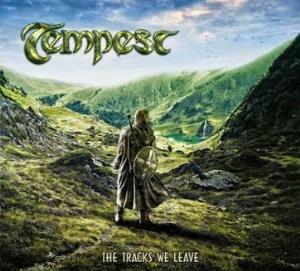 The latest smorgasbord of Celtic ditties from American folk rock band Tempest can be heard on The Tracks We Leave, their tenth studio album and their first since Another Dawn released in 2010. If you are at all familiar with Tempest you pretty much know what you are going to hear; well-crafted Celtic rock and folk but also including influences from the Middle East and northern Europe. As you would expect from seasoned veterans, the musicianship and vocals are very good and the melodies are strong. Songs like the album opening "Rantin' Rovin' Robin" and the title track, with its pretty piano intro, 'thunderstorm' sound effects and almost trippy atmosphere are prime examples of the band's Celtic roots. On "Alle Mann Hadde Fota" Norwegian sung vocals and Middle Eastern tones add a world flavour, as do the Eastern touches on "September Jig", a rocking instrumental. The album was produced by the talented Robert Berry so you know the production quality will be of a high standard. If you like Celtic flavoured rock The Tracks We Leave will make a fine addition to your music library. For further information check out the band on Magna Carta Records.